Capsule: #1 Deprogramming Liberalism with Nuclear Counterarguments is a primer for the Nuclear Counterarguments Essay Series, setting out its purpose which focuses on understanding the ideology of contemporary American liberalism – how it originated, how it operates, how it spreads, its motivations, and its sociological and psychological implications. Throughout this exploration a strategy of exit counseling (that will be nothing less than eye-popping), is offered for the liberal reader to free them self from the inherent paranoia of contemporary liberalism. The conservative reader will be enlightened with profound insights that cannot be found at any other source. Focus: As a principle, would you prefer others to direct your life, or would you prefer to have the freedom to direct your own life? Answer this and I will tell you who you really are – and who you are not. Details: #1 Deprogramming Liberalism with Nuclear Counterarguments reveals one important reality above all: Virtually every contemporary American liberal (and progressive) lives a life of blatant contradiction, primarily living their ideological life as a liberal, while also passionately possessing a core belief that is exactly 180 degrees out of phase with that liberalism. To be confronted with this contrast is like a double-kick to the chest – the realization that the vast majority of self-proclaimed liberals, when defined by their core beliefs are in fact, not liberals at all. This realization then opens wide a door for the liberal reader to understand the negative implications and unintended consequences of their affliction, and deal with them head-on. The contemporary American liberal is a product of a societal conditioning propagated on a foundation of paranoia which drives the afflicted subject into the deceptive comfort of attempting to create a safe, collectivist utopia at the expense of individual liberty. The N.C. Essay Series offers a process through which those afflicted can effectively dispense with that paranoia through a rediscovery of the core American value of individual liberty. Unsurprisingly, I call this exit counseling process deprogramming liberalism. I expect you are at least a little surprised and perhaps amused to discover an essay seriously proposing that liberalism (or progressivism, if you prefer) is the result of some sort of brainwashing technique requiring cult-like deprogramming. That, however, is not exactly my contention, although I can see how someone first encountering the title, Deprogramming Liberalism might reasonably draw that conclusion. While deprogramming is technically a forced intervention, whereas a voluntary procedure like reading this Nuclear Counterarguments Essay Series falls closer to what is known as exit counseling, few would catch the meaning of an essay entitled Exit Counseling Liberalism, so I will continue using the term deprogram presuming you know what I mean. To help you see them objectively I suggest that while reading this N.C. Essay Series you resolutely appropriate the demeanor of Mr. Spock from Star Trek. If you are unfamiliar with this old science fiction television series, Mr. Spock was a half alien Science Officer on the starship Enterprise who had virtually no emotions and deliberated every situation solely by logic and results. This lack of emotions also allowed him to be essentially fearless. As Mr. Spock you will now resolve to decide each issue presented in the N.C. Essay Series strictly on its merits and rational deduction, and detach yourself from any preconceived notions, ideology or induction. Obamacare – over 20,000 pages of slavery to the government. President Obama calls this “a light touch when it comes to regulations.” Minority House leader Pelosi claims, “It captures the spirit of our founders”. I call it “slavery”. What would you call it, American neighbor? To enable you to sustainably implement this unnatural type of objective information processing we will incorporate something similar to what is known in the psychotherapy world as third ear listening. In effect there will be three of us proceeding through the N.C. Essay Series. Of course there will be me your deprogrammer, teaching and guiding you through your deprogramming, and of course there will be you, a subject of societal programming, reading and responding within your liberal mind-frame to my presentations. Your Mr. Spock demeanor completes our trilogy utilizing third person analysis to enable you to step back from your liberal self to objectively analyze your own reactions to issues and scenarios that I present. To facilitate this I will address you apart from your liberalism, based on your Mr. Spock demeanor. Together we (your Mr. Spock demeanor and I) will examine liberals and the ideology of liberalism from the outside looking in. 1. My first impressions are always right. 2. I don’t care to know what other people really think of me. 3. Once I’ve made up my mind, other people can seldom change my opinion. 4. I am fully in control of my own fate. 5. I never regret my decisions. 6. I am a completely rational person. 7. I am very confident of my judgments. Liberals believe that they stand on the moral high ground in regard to human rights issues. They see the closing of the Guantanamo Bay detention facility as symbolic of their defense of human rights. Their argument is that former President Bush illegally, or at least unethically held foreign prisoners captured in the Middle East for indefinite periods without due process and trials. Liberals strongly condemned the Bush administration for what some consider war crimes or crimes against humanity. Liberals like to equate these terrorism suspects with common domestic criminals and demand the same rights for them. All citations are active number/letter codes. Code links beginning with an * indicate that the linked page has additional information for the topic at hand. Links without an * are cited for evidence of existence and reference only, as in a quotation or number or case in point. Citations validate my points so that you can trust my claims, and will often provide you with invaluable supplemental information. One other technical note: I utilize what is known as logical punctuation in regard to quotations rather than the common mandates of the Chicago Manual of Style. [nhqbx] Logical punctuation allows for a faithful quotation without introducing foreign punctuation within the quote that may erode its accuracy. It is all about trust – I want you to be confident in what I present, American neighbor. The “collateral damage” refers to the unfortunate neighbors. Literally hundreds and maybe thousands of Pakistanis have been killed as collateral damage. 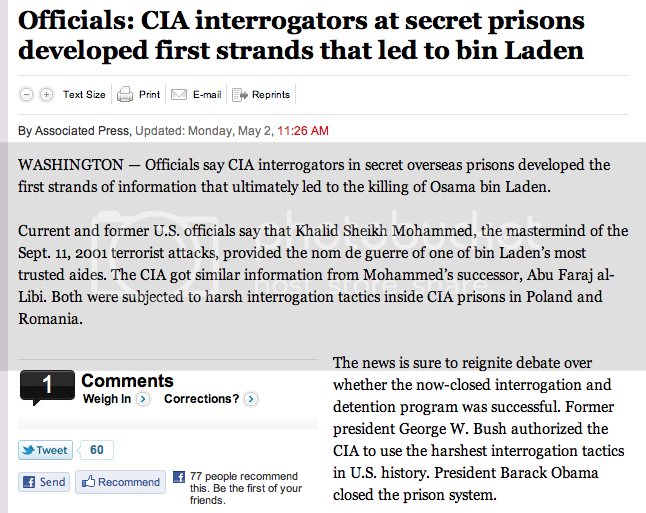 So are liberal demands for due process for Guantanamo detainees an example of upholding human rights? No, human rights are simply an excuse to condemn a disdained political rival in former President Bush. If it were about human rights liberals would be demanding that the suspected terrorists in Pakistan be at the least arrested and brought to trial. This is an example of liberal double standards. Condemning former President Bush for holding terrorism suspects indefinitely without due process or trials is political demagoguery and has nothing to do with human rights, otherwise liberals would also condemn President Obama for executing them along with their families and their neighbors with missile attacks in Pakistan without due process and trials. After all, we don’t send police out to execute suspected bank robbers, muggers or even murderers, and most liberals don’t believe in the death penalty for any reason, anyway. So after only a couple of dozen paragraphs I already sense anxiety in you, American neighbor. Are you not even now scrambling to think of some way out of this conundrum? Perhaps you are thinking that former President Bush also executed suspected terrorists with missiles, but if former President Bush is to be condemned for war crimes or crimes against humanity at Guantanamo Bay, then he is no less to be condemned for his missile attacks for the same reasons. How does this excuse President Obama? It doesn’t, and your logical Mr. Spock mind knows it, American neighbor. You have now learned a second principle in understanding liberalism: Without irrational double standards contemporary liberalism cannot exist. Commit this to memory, American neighbor. You will see it displayed over and over as we proceed. Contemporary liberalism requires a strict adherence to playing stupid. Without irrational double standards contemporary liberalism cannot exist. I don’t want you to think of the N.C. Essay Series as an ideological battle, American neighbor. It is not your job in reading this essay series to make ideological judgments on the issues presented. The reason I say this is because, being a liberal you will naturally jump to the left side of each issue if you make ideological judgments. That is what you have been conditioned to do, and that would be counterproductive. To avert this I want you to see your job as judging each issue on its merits of reasoned analysis (remember, you are not reading this essay as your liberal self, but as your Mr. Spock demeanor). The above example of what to do with terrorism suspects is not an ideological choice. It is an analytical choice. Once the analysis is exposed it becomes obvious that to hold Bush in contempt for supposed human rights issues over Guantanamo Bay is an irrational double standard unless one also condemns Obama for the missile strikes. Demanding one be brought up on charges of illegality means bringing both up on charges of illegality, and conversely, finding one innocent extends to the other. Follow the reasoning, not the ideology. Remember Mr. Spock. Remember to utilize third person analysis. More later. Allow me to introduce myself, American neighbor. My motto is, to boldly think where no man has thought before, and in my most elevated moments I fancy myself as a ‘liberal deprogrammer’. However, when I come back down from the interstellar clouds I find that I am little more than a research-junky/polemist who specializes in the liberal/conservative dichotomy. I am sort of a freelancing one man think tank devoted to understanding and remedying the affliction of conditioned liberalism in American society. You however may at first see me as a bully attempting to intimidate you with beliefs contrary to your own, but I am not a bully, American neighbor, and again, I am not your enemy. I am very patient, I won’t swear at you, I am not given to throwing around derogatory names, and I will do my best not to appear condescending to you (except sort-of in one essay, which is actually a test). Indeed, I will attempt to engage you with one of your own most precious perceived virtues – compassion. I sincerely wish to help you understand how programmed liberalism hampers your life, and America’s. I will presume you are at least somewhat aware of most current and historic political and societal issues. I will appeal to you as a critical thinker. As such, I will presume you are intellectually capable of following reasoned arguments. I will also presume you are not a scoffer who simply waves off counterarguments with no analytical assessment. Basically a scoffer is a know-it-all who thinks he has nothing to learn – sort of like a rebellious fourteen-year-old who can’t be told anything. I am afraid I have nothing to offer liberal scoffers and feel sorry for them. Unfortunately, as is true with dogmatic scoffers of any kind, without an attitude adjustment, both rebellious fourteen-year-olds and liberal scoffers are beyond reason or help. You might wish to question my ability to comprehend American society from Canada. On the surface, a valid objection, I admit, but as is true with many topics of research, one need not live on the moon to learn about the moon (especially now that all the world is but a few clicks away). In fact I have an innate advantage – America has been evolving ideologically left, and I live in a country just next door that is thoroughly integrated with American culture and yet is mostly two liberal steps ahead of where America is headed on many issues. American liberals are only now dreaming about a society that I live in many ways as a nightmare everyday. I would say this makes me uniquely qualified to understand contemporary American liberalism. America is as much of interest to Canadians as Canada itself is, and to me much more so. The Canadian news programs I listen to are filled with American stories and have their own following south of the border. You need not doubt me when I claim to be informed about American political and societal issues from both the right and left side of the spectrum, American neighbor. You will not find the N.C. Essay Series just a simple regurgitation of other conservative authors and talking heads. Indeed, even they will often fail to see my counterarguments coming and will be as astonished as you, American neighbor. Maybe it is that to be an American is to climb the mountain that is America, and it may be that American commentators are too close to be able to see the many aspects of their own mountain that someone like me can observe from the mountain across the valley. I gaze at your mountain everyday using 3D imaging, satellite radar mapping, and powerful field glasses, examining every nook and cranny. The internet and the radio are my predominant windows into your liberal world. It is likely that it is because I am an informed outsider looking in that I am able to generate my unique assessments of America. I do not have to worry about opinion polls, nor do I have a television audience to satisfy, nor a talk radio audience, and nor do I have to come up with clever insights each week to satisfy some editor. Neither is the Nuclear Counterarguments Essay Series a production of a committee of researchers and assistants as are many political books. It is just you and me, American neighbor. My sole focus in writing the N.C. Essay Series is you. President Clinton actually aligned America with a recognized Islamic terrorist group that essentially were domestic terrorists in Serbia. Did liberals demand rock-solid evidence before the war began? No. Did liberals demand a UN resolution before entering the war? No. So here is our next 800 pound gorilla. Where were liberals demanding impeachment and jail time for former President Clinton for conducting an “illegal war” based on outrageous administration fabrications of propaganda? Where are their parallel demands for Clinton to be tried for the same supposed crimes as Bush? What about you, American neighbor? Were you a liberal who conveniently excused former President Clinton’s gross vilification of the Serbs and the subsequent war? Did you even know that the Serbs were responding to a domestic terrorist insurgency within their own country? Maybe you didn’t even know that the Serb war was based on a gigantic fraud. Of course that would not be entirely surprising since the orthodox media filter didn’t exactly report that part of it, but there were liberals that knew. There were big name liberals in the Democratic Party that knew. The orthodox liberal media knew. They could have made it common public knowledge if they had chosen to do so, but they didn’t. After all, Bill Clinton was one of theirs. But former President Bush? He was the political opposition. They preferred to keep you ignorant, knowing little or nothing of Clinton’s deception and instead hypocritically demanding so-called justice for Bush. You were played like a fiddle on these two wars, American neighbor (and much more than you yet know – later). Here we have our second example of our first principle of liberalism: Contemporary liberalism requires a strict adherence to playing stupid. The fact that Clinton fits the exact accusation liberals use on Bush should set off alarms bells for you, American neighbor. Do you see the double standard? Like I mentioned earlier, our second liberal principle is: Without irrational double standards contemporary liberalism cannot exist. American neighbor, can you see that without a double standard there is no liberal argument for prosecuting former President Bush without also prosecuting former President Clinton? Take the first example I gave above about President Obama approving missile strikes in Pakistan. If you were to do an internet search for >Obama missile strikes< you would soon find a media report about President Obama approving of the mission referred to above before it was executed. You also might find his campaign pledge to take action in Pakistan to engage the Taliban and al Qaeda even if the President of Pakistan refused. [3dx87gb] Think about this, American neighbor. Candidate Obama was willing to make war in a supposed ally’s territory and risk turning them into an enemy. Is this a liberal position? Sheesh! Most liberals didn’t even agree with invading a sworn enemy’s country as with Saddam Hussein in Iraq! Even former President Bush was never so reckless as to make such a threat against Pakistan. And thanks to the chair of the Senate Select Committee on Intelligence, Senator Dianne Feinstein (D), it has been confirmed through her verbal slip-up that Pakistan had already been cooperating with the American military, by allowing the Predator drones that killed those terrorists and their neighbors to fly from one of their own bases. [y8a9to6] But then candidate Obama was willing to jeopardize America’s relationship with a valued ally in the war against the Taliban and terrorism just to sound tough for votes. Of course being a liberal and appealing to liberals, Obama knew he could get away with presenting a double standard, knowing full well as President he would never send American troops to invade Pakistan based on the then current conditions. You can see from my first two examples of liberal double standards that it is not my conservative ideology that leads my position on issues. Yes I am a conservative, but I am not a conservative simply because I have chosen this side of the argument. It is because reason drives me to it, American neighbor. Reason tells me that there is more than one human rights issue here. First there are the human rights of the innocents killed by the missile strikes, and then there are also the human rights of the innocents that will be murdered by these terrorists if they are not stopped. There is a choice to be made. I choose to agree with President Obama and support killing the terrorists, and if need be their innocent neighbors, over allowing the terrorists to directly or indirectly kill me or my innocent neighbors at some time in the future. The human rights of my neighbors are paramount to the human rights of their neighbors. Do you agree with me, American neighbor – and President Obama? Or do you still hold to a double standard liberal view that you can have your cake and eat it too? Somebody’s neighbors are going to die. Which do you prefer, American neighbor – theirs or ours? So why do you then hold against Bush what you will not hold against Obama? And if it is OK for both Bush and Obama to execute suspected terrorists in their homes along with their neighbors without due process, then why is it not OK to hold suspected terrorists indefinitely without due process in the Guamtanamo Bay detention facility, which is arguably a much lesser sentence than execution by drone? Ask yourself this: Is the quandary under your liberalism in this matter a result of mental instability or the result of a conditioned response? Hopefully you find it is the latter, American neighbor. Rationally there are no other choices. If this is true, it is also true for virtually all of your liberal positions. They are all conditioned responses. So maybe you would like to reconsider your position and choose the one resulting from contextual investigation and critical analysis – the conservative position. Liberals argue that the detainees at the Guantanamo Bay detention facility are being denied their human rights. That may or may not be the case depending on one’s definition of human rights and who are entitled to them in what circumstances. But again, it is about the same choice. Do I object to holding terrorists indefinitely in the Guantanamo Bay detention facility even though some may be unknown innocents inadvertently caught up in a war they wanted nothing to do with? No, I do not object. It is no less justifiable than if they would have been killed by a Predator missile directly ordered by President Obama. If there are unknown innocents in the Guantanamo Bay detention facility they are no more unfortunate casualties than the dead neighbors of those terrorists in Pakistan – indeed, they are much better off. They are the price war extracts from civilians of one side of the battle to protect civilians on the other side of the battle. I am willing to take the chance of incarcerating some of their innocents to prevent deaths of our innocents. So you see, the argument is less about human rights as an absolute, than it is about whose human rights under what circumstances take precedence. Former President Bush chose the human rights of my neighbors over the human rights of the terrorists. President Obama agreed with the former President in regard to the terrorists in Pakistan, but sets up his own double standard when dealing with the terrorists in the Guantanamo Bay detention facility. Given the choice I would prefer that those detainees had been killed by missile strikes in Pakistan rather than being released from Guantanamo Bay by some civilian court because the soldiers and CIA operatives that apprehended them were not schooled as police officers to uphold civilian legal charges against them. Former President Bush capitulated and released many detainees hoping that they were truly innocents or that they would uphold their pledge to not return to terrorism, and yet many did return to radical Islam and the former President may yet end up with the blood of my innocent neighbors on his hands because of those erroneous capitulations to political correctness. [*cuu7pds, *yd39247, *d3op5h, *2czcaka, *25yk528, *pm82epo] (President Obama has released at least 66 detainees. If any of them go to Pakistan or Yemen, do you think, given the chance that he won’t kill them with drone missiles if they again affiliate with al Qaeda? Of course he will.) If President Obama yields to the demands of his liberal supporters and some of the remaining terrorists are released by a civilian court for lack of legal evidence to convict them or because of legal technicalities, the President and those liberals supporting him will have on their hands the blood of the innocents those terrorists kill sometime in the future. You see, American neighbor, the double standard has a consequence to it. No matter what the outcome, innocents will suffer. Would you rather it be their innocents or ours? Will you be one of those liberals with the blood of your own neighbors on your hands, American neighbor? Think about this, American neighbor. The liberal position of granting rights to civilian trials for the Guantanamo detainees actually grants more rights to these terrorists than World War Two prisoners of war had. This is really a zombie argument. In case you are unfamiliar with a zombie argument, it is an assertion that has been repeatedly proven invalid, but is continually raised from the dead as though it is still credible. Liberals insist that terrorist captives deserve coverage of the Geneva Conventions despite it having been repeatedly illustrated that illegal enemy combatants fall outside the jurisdiction of the Geneva Conventions. Indeed, President Obama’s choice for Attorney General has also expressed his opinion that the Guantanamo detainees are not covered by the Geneva Conventions. Yet liberals desire that foreign terrorists be tried in NYC. (800 pound gorilla alert!) So why do you think that WWII German and Japanese soldiers who fought according to the rules of war were not granted trials in NYC? Were they less worthy of rights to trials than terrorists who do not fight according to the rules of war? Can you not see that liberals have this whole situation turned backwards, American neighbor? Terrorists deserve less rights than legitimate prisoners of war, not more. In another huge example of liberal double standards Barack Obama authorized the assassination of an American citizen turned terrorist with drone missile strikes in a country that has not been declared or even considered a war zone. [*23pbzwl] Now over a year later authorities have claimed that they have indeed executed Anwar al-Awlaki with a drone missile attack. [5rr4gwo] If this had been under Bush you know liberals would be demonstrating in the streets, American neighbor. Under Obama? No big deal, but to the conservative this is not just an American citizen. He is a dangerous traitor who is a current threat to the lives of innocent Americans, justifying his pre-emptive assassination by drone as a defensive act of war against a known terrorist. As we conclude this first essay I want to encourage you to tone down your emotions and turn up your Mr. Spock demeanor, American neighbor. No one enjoys having their ideological legs kicked out from beneath them, but you have to look at this as remedial, not an attack on you. That you are willing to persevere through this at all is greatly to your credit, American neighbor. I want you to know that you are not alone, American neighbor. Many Americans are in the very same position as you. Liberalism has stolen away liberty as the universal core value of America. The Nuclear Counterarguments Essay Series is about getting it back, one American at a time. This week it is your turn. Next week it will be a co-worker’s, a friend’s or a family member. Contemporary liberalism is rife with unintended consequences. The process of deprogramming liberalism is about providing you with alternative choices to your liberal world view based on analytical deductions rather than ideological presumptions. Each time your choice is based on analysis over ideology you are confirming your first, core choice of this essay, a desire to direct your own life, American neighbor. Choosing analysis over ideology is a choice to direct yourself to reject the playing stupid of our first liberal principle. For instance, by concluding that as an ethic there is no difference between President Bush holding terrorism suspects in the Guantanamo Bay detention facility and President Obama’s decision to bomb terrorism suspects in remote Pakistan, you have affirmed the very real existence of the second liberal principle of double standards, and have rejected it as irrational thinking – playing stupid. Again, these conclusions were confirmed when examining the parallels between President Bush’s justifications for invasion of Iraq that have been framed as lies, and President Clinton’s obvious propaganda used to enter a war against Serbia – there is no difference, we are discussing the same ethic. Another confirmation is the liberal double standard demand for civil rights for terrorism suspects that even legitimate prisoners of war have always been denied. Through the choice of analysis over ideology you have had the liberal principles of playing stupid and double standards revealed to you, American neighbor. This has provided you with a freedom of personal choice over that of others directing and limiting your choice through foreign principles that contradict your core value of liberty. Continue making these choices, American neighbor. The more you do so, the more you will realize that at the core of your being you are not a liberal. Here is another exercise. With no warning or pre-explanation go ask your liberal and conservative friends and acquaintances our core question: As a principle, would you prefer others to direct your life, or would you prefer to have the freedom to direct your own life? (Again, don’t give them any hint that it is coming.) Do you think any of them will not choose the self-reliance of freedom, American neighbor? Do you think any of them are actually liberal at the core of their being and will prefer the collective interdependence of being herded around like sheep? Neither do I.
I am a big believer in the direct relationship between sleep and the ability to think through problems and new ideas. It is important that you go to sleep at night pondering the new ideas you have discovered here each day. This will lead to new insights and realizations the next day, or even when waking during the night. Many concepts in the N.C. Essay Series came to me lying awake at four in the morning. Now for a little humor to break the tension at the end of this essay, American neighbor. It is from my “And you thought Sarah Palin was stupid…” file, and is a sneak preview of another principle of liberalism: Contemporary liberalism is absurd.